Why the Puerto Cruz Rastro merits top five stars. 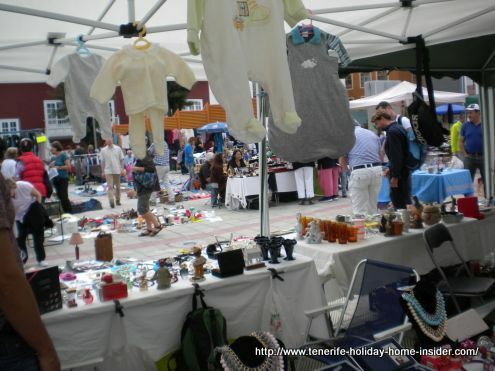 The Puerto Cruz Rastro Flea Market and municipal Mercadillo is a real attraction of Tenerife. 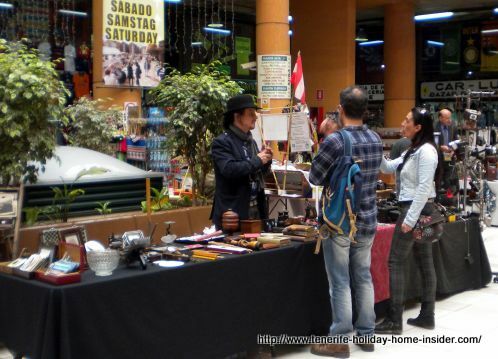 In winter at least..
Puerto Cruz Rastro flea market with one of its experts with stall for vintage and antique objects. 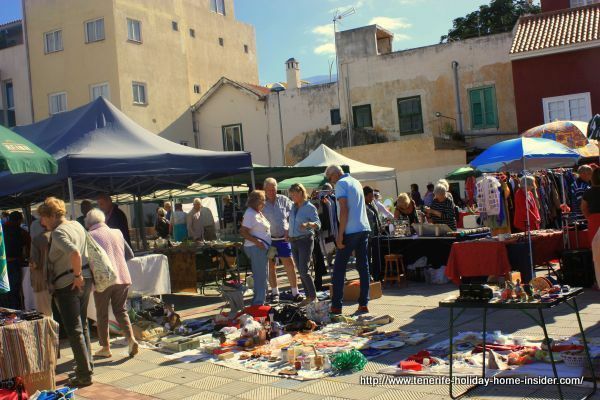 A once weekly Saturday market for its amazing used and antique goods in particular was soon not enough. It warranted an additional Wednesday by popular demand. Now, special buses even bring tourists from Tenerife South. 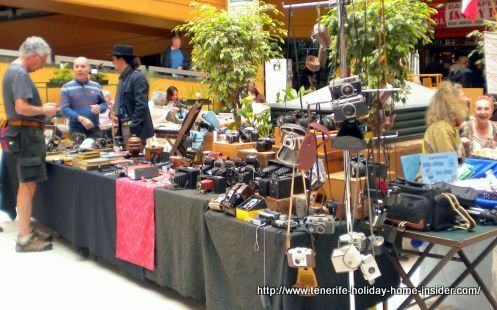 The remarkable set-up of this Tenerife shopping enclave. A market place with buzzing life by a couple of large shady trees is only the overture of a large multi player scenario. It follows on three levels inside a complex that is extremely functional. Antique furniture on street level. Collectors items near one of the escalators on the ground floor. 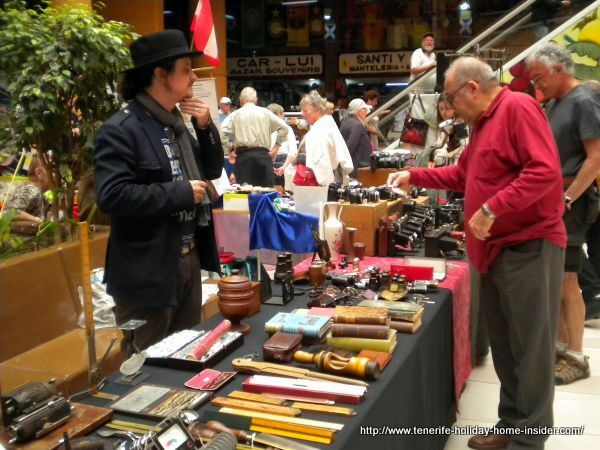 It wouldn't meet the standards of a chic mall, but people are much at ease in its Bohemian surroundings where high class dealers mix in. Tourists and locals alike sip their drinks and coffee on the outskirts of the many stalls that are arranged in any odd ways. 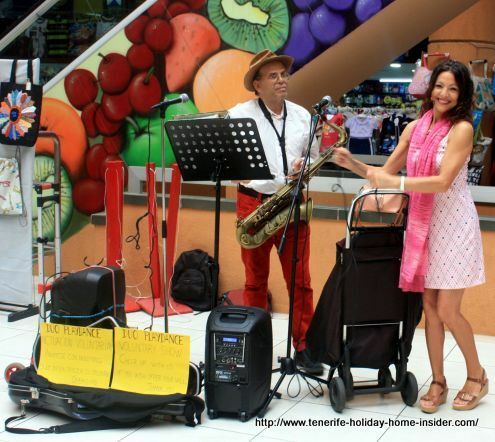 Free live music by Lena and José who sing anything from Jazz to Bossanova or classic retro chansons that are loved by most. The empathetic couple are now always entertaining at this versatile interior patio. It's a true atrium that's open as far as the top floor. It draws everybody in. In fact, some only walk through to do their weekly grocery shopping at a big Altesa supermarket in the back of the hall. 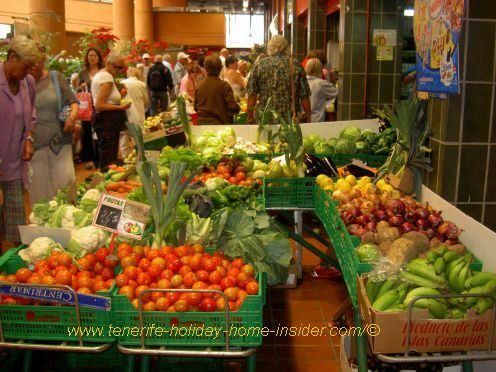 Others only go to the Puerto Cruz municipal Mercadillo with its fresh produce. Puerto de la Cruz municipal Mercadillo with its fresh produce. This farmer and fish market is on the Southern and Northern gallery on the first floor. 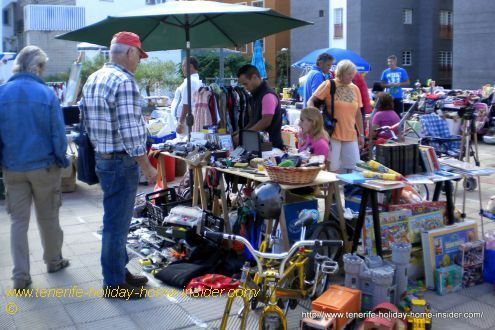 Otherwise, find a few small shops on the other sides. There is a butcher beside a pharmacy and a seafood business with an open shop front. Another sells Tapas takeaway. 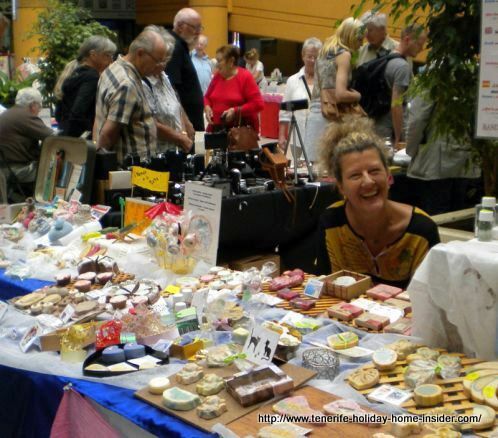 Not to forget is that shop where the most delicious home baked goods are sold with top ingredients. It's not cheap which is understandable. Flea Market treasures of kitsch or of value. Two escalators flank the hall. They connect open galleries on three stories which include a most surprising rooftop market. Puerto Cruz Rastro roof top where more quality articles are found in good condition that are often neatly displayed on tables. Bric a brac objects mixed with surprises for the treasure hunter on the roof. Roof top flea market flanked by small houses in the background. On the ground floor, green pot plants and colorful murals liven up everything. 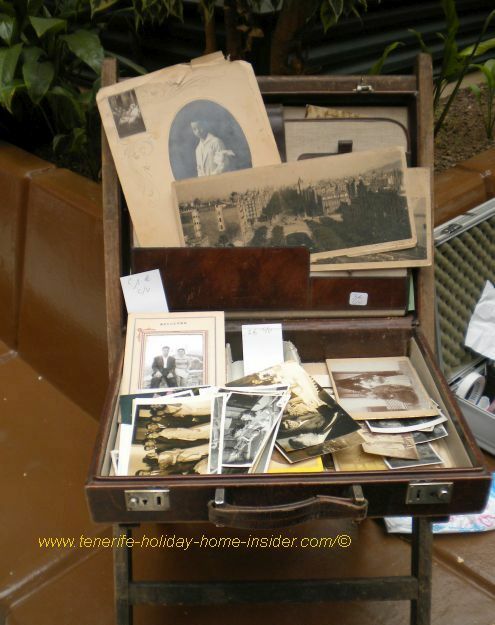 Rows of new clothes in exotic fashion and patterns go hand in hand with antique collector items or bric a brac. 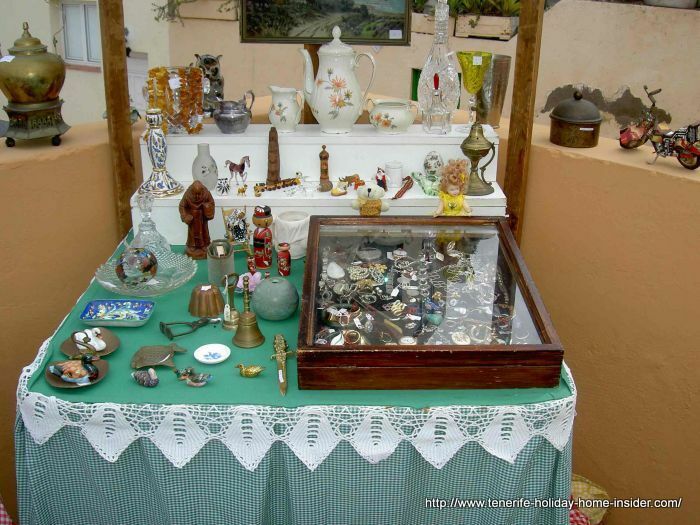 Valuable jewellery behind glass which belonged to an antique dealer in Santa Ursula. 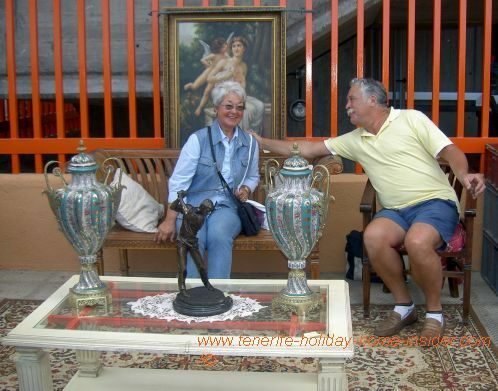 Puerto Cruz flea market with a most welcoming house wife who displays her innovative gift objects made at home. 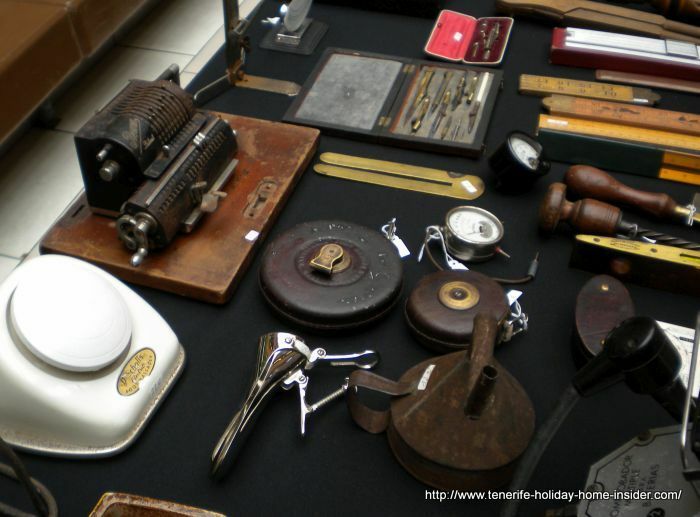 Precision instruments, some of which are antique and rare. Anything goes from Retro and vintage to daring designs and fantasy art. Often, there's strong evidence that Tenerife is a leading spot of Spain for artistic and outrageous carnival design. 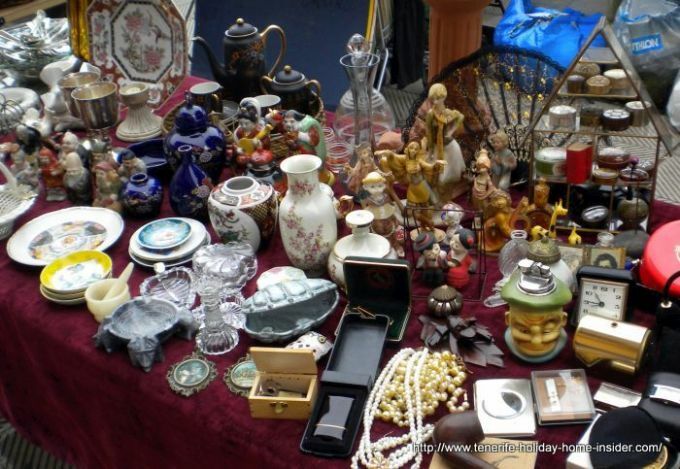 This kaleidoscope of treasures invites for explorations and the thrill to bargain hunt. The same vibes prevail outside, except for long rows of lucky dip tables where any size and kind of 2nd hand clothes are jumbled up. The whooping price is only a single euro for four garments. Strangely enough, it hardly happens that you have to gang up with a friend to make the quantity viable. 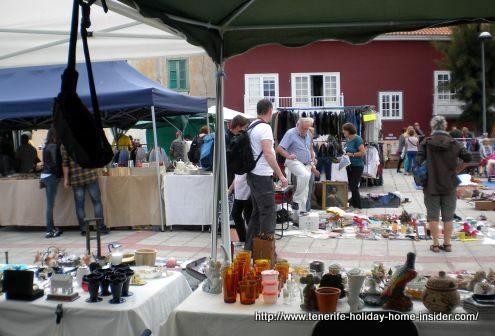 By the latest on your way back from upstairs you find the energy to confront that real flea market spot by the wall. No creepy crawlies that bite you, not that. However, usually your arm wants to fall off from turning heavy stacks of clothes when you dig into the piles. By the way, this particular spot is a reason to be early and big crowds in the narrow alleys by the walls can become hurdles. Address and opening times of the Puerto Cruz Rastro. Opening Times: Saturdays and Wednesdays from about 8.30 in the morning to 2 p.m.